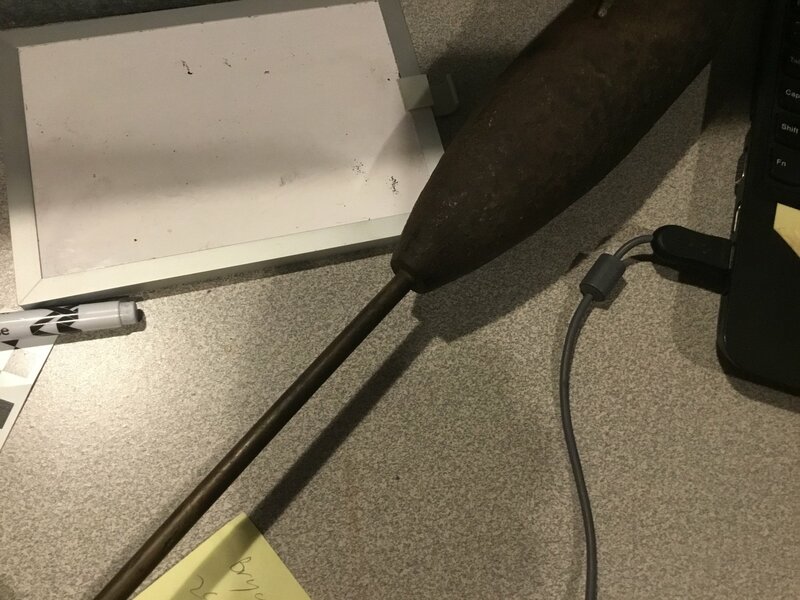 I’ve been tasked with identifying some items in the collection at a local museum. I’ve been able to identify many of them, but two in particular have proven frustratingly difficult to identify. 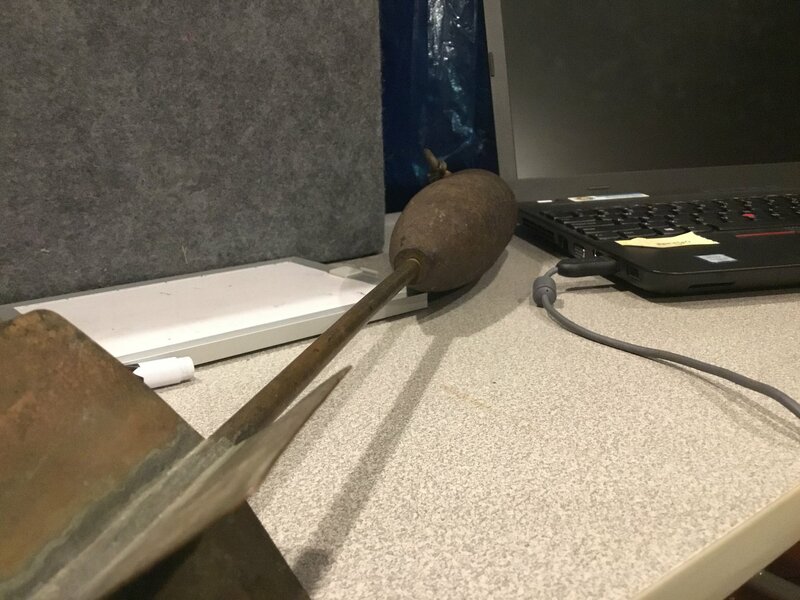 The first looks like a practice bomb of some sort, but I’m not sure what it is. 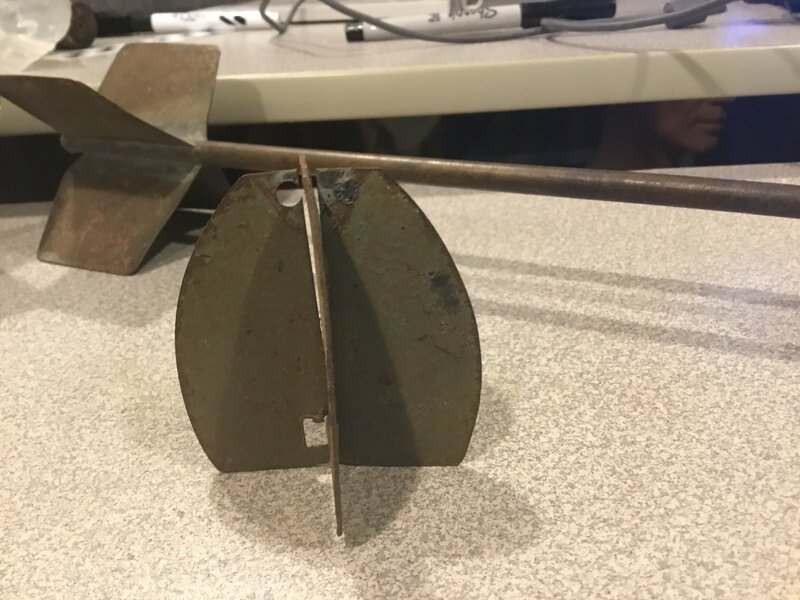 It was purchased at a flea market from a man who claimed to have found it near an old base in the Great Lakes area. 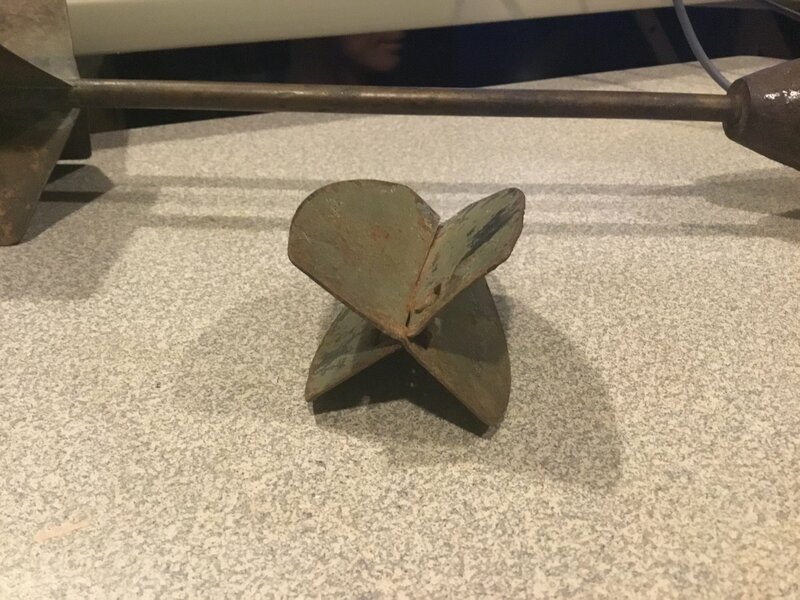 The other is a set of fins collected by a soldier from a World War I battlefield and brought home as a souvenir. Here are some pictures of the items. Does anyone have any idea what they could be? This set of fins seems to be for french 60 mm Brant pneumatic mortar WW1. Thank you so much! That looks exactly like the fins in the collection. Now, if only I could identify the larger artifact. Complete guess here but is it perhaps a towing drogue or paravane of some sort? 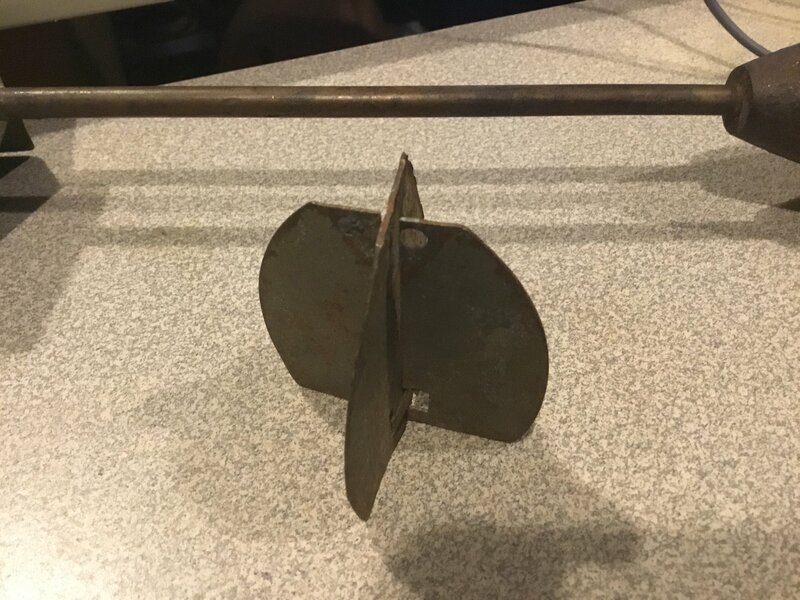 I recall seeing something similar that was used on the end of long minsweeping nets or lines towed out behind a minsweeper I believe their purpose was to weight the line and also to keep the tow relatively straight. I know the actual paravanes themselves were much larger but I wondered (given the eye and cable) if it was not some sort of weight for the line? As I say - a pure guess. Interests:The great war in all its forms. 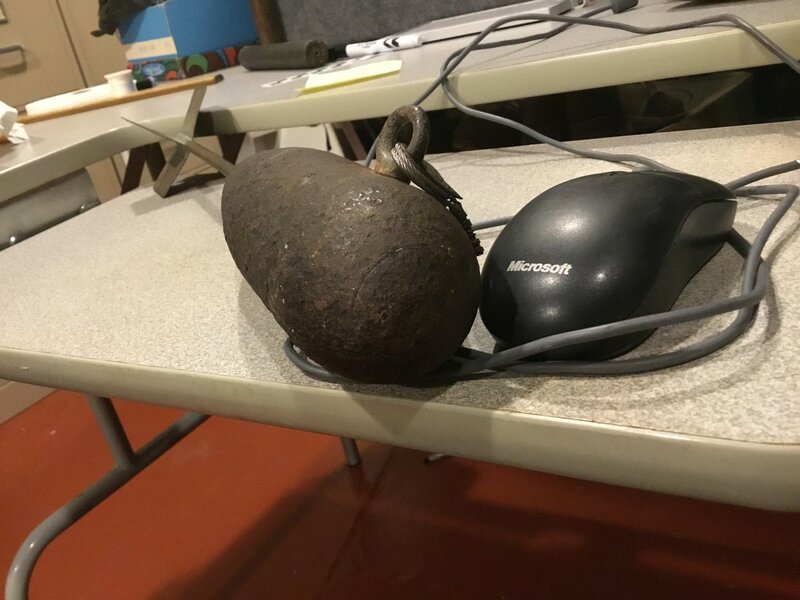 The first one is definitely a computer mouse, probably microsoft, circa 2010-2011. 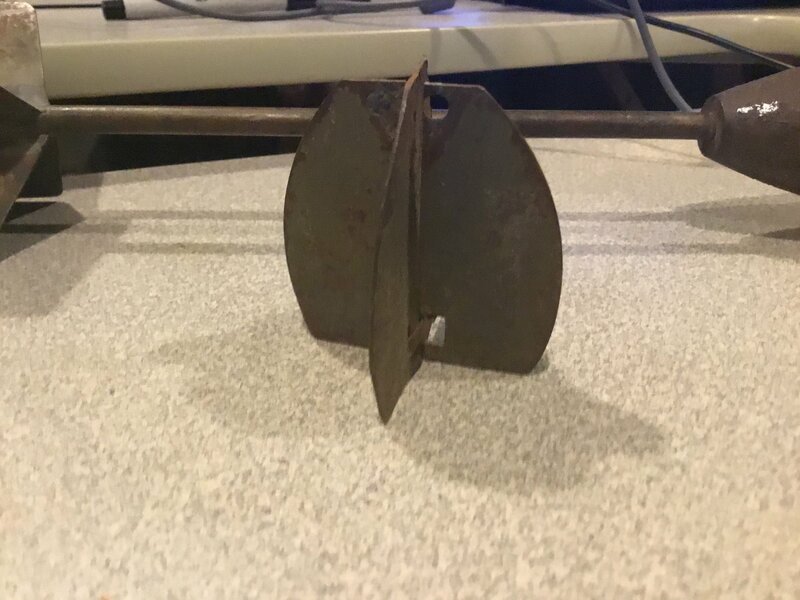 Would such a thing be found around the Great Lakes? I know some minesweepers were built on the Great Lakes, but were there any training exercises there during World War I? Also, I don’t think you can rely on the cable for identification. It’s probably not original. 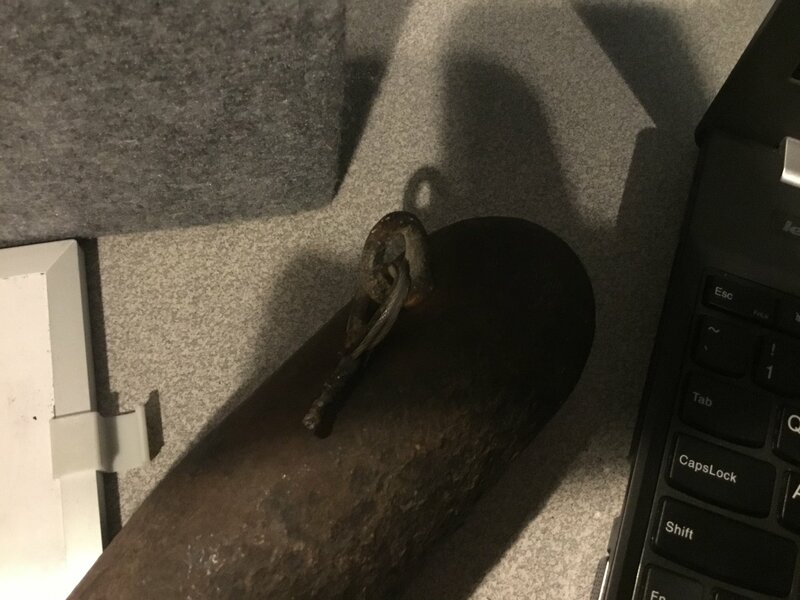 The artifact may have been hung up as a decoration at one point. The eye is likely original, though, but I’m not 100% certain. We don’t have any documentation of the artifacts history here at the museum besides what the seller told us. 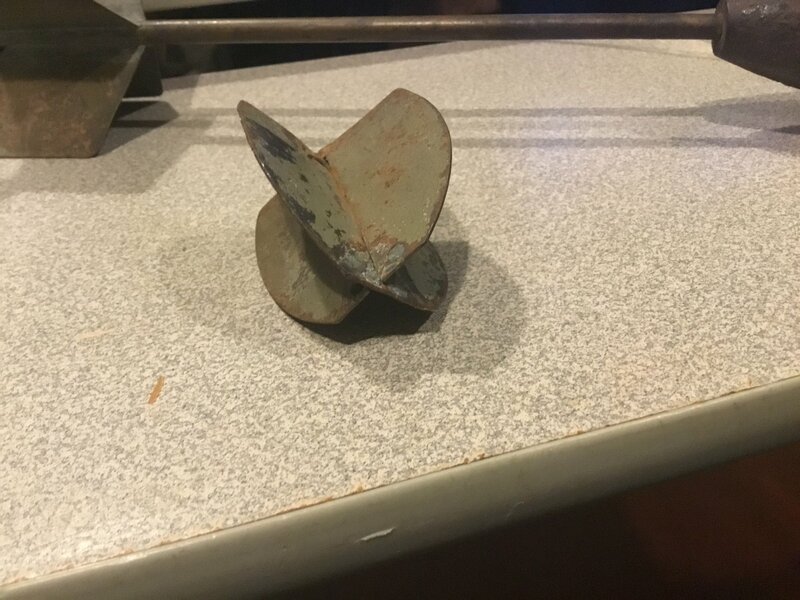 All we know is that it was found somewhere around the Great Lakes, and the seller claimed it was found on a bombing range at an old base. I'm wondering if it's some sort of practice bomb, may be an avenue worth exploring. 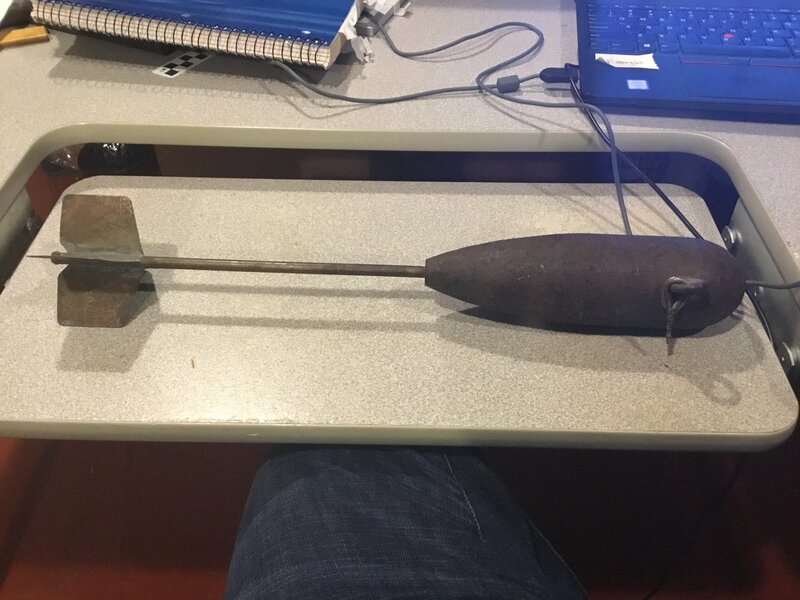 Do you know anything about WWI practice bombs? 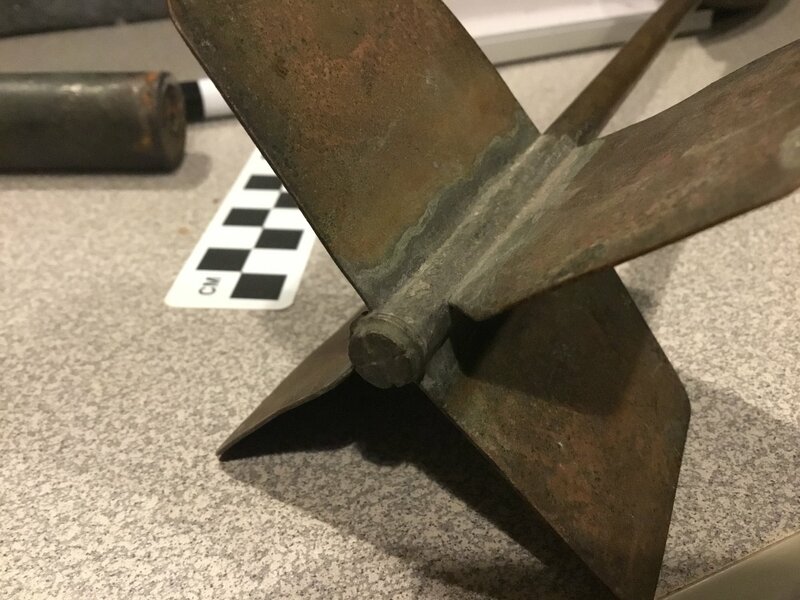 I haven’t been able to find much information, and the examples I’ve found don’t match the artifact. It looks like a mini paravane to me, at least that was my first impression. Given that the main purpose of a paravane is to ensure that the cutting cable is held both taught and at a set depth, could this not be some part of trawling (Commercial Fishing) gear? Keeping the mouth of a net open? A total confection of whimsey and conjecture on my part, BTW. The long-tailed jobbie with a mobile eye attachment looks like a line-throwing projectile to be fired from some sort of projector. Designed not to land on the target, but to straddle it, allowing the trailing line to be easily recovered. 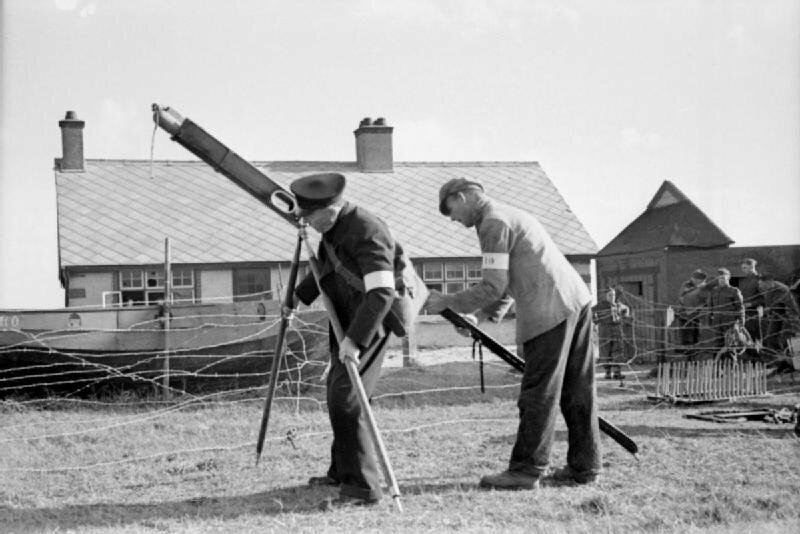 Good call, Siegegunner - like the rocket fired out of projector for a "Breeches Buoy"
Do you think it was from a breeches buoy? It doesn’t look like it to me, though I’m not exactly an expert on rope-based rescue devices. On top of that, the thing weighs nearly ten pounds. That’s a bit on the heavy side for something used to launch rope in that manner, don’t you think? If it was meant to be towed, the eye would on the point of its nose. The position of the eye and the loop attached to it suggest a trailing line. The tail-fins are not very big, but perhaps big enough, in conjunction with the long shaft, to stabilise the head in flight. So unless it is meant to be dropped vertically for some purpose, I still think it is a projectile, even weighing 10 pounds. If it was meant to be towed, the eye would on the point of its nose. Not sure this is necessarily true - think of the design of some fishing lures. Also ,if it was a weight on a line running perpendicular to the direction of tow (ie a cross line), then the eyelet might well be placed in this position.